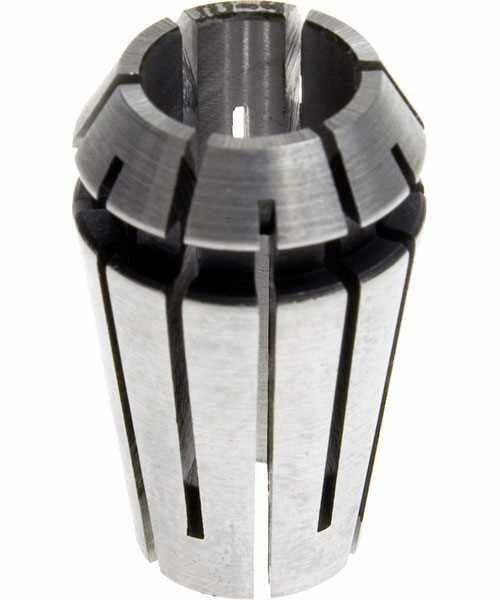 Unlike R8, 5C and Morse Taper collets, ER collets are slotted alternately from both ends and therefore compress onto the cutter along the whole length of the collet when tightened. This not only provides a better grip on the cutter shank but also allows some variation (typically 1mm) in shank sizes that may be used in a single collet (the ‘Clamping Range’). The smaller size collets are best used to hold cutters no more than 0.5mm below the nominal size. Inspecting the inside of our ER collet nuts reveals an internal flange that has been machined eccentric to the main axis of the nut. This is not a machining error but is designed that way to lock onto the groove of the collet and aid its release from the chuck body. For this feature to work properly, the collet must be mounted in the nut first before fitting the assembly into the chuck body. To mount the collet in the nut, insert it on an angle, turn slightly and push it into the nut until it clicks into place on the eccentric flange. The cutter may now be fitted and the assembly tightened hard into the chuck body. To remove the cutter, slacken and undo the nut until resistance is felt. Then, using a collet wrench, further undo the nut until the collet is released from the chuck body. Removal of the collet from the nut is the reverse of the mounting procedure.